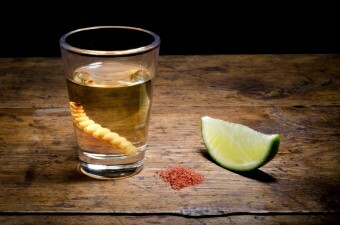 Who Invented Tequila and What about the Worm? Kerry asks: Who invented tequila? I was also wondering if they really put worms in it? Although tequila dates back only a few hundred years, people have long used the heart of the agave plant to make delicious, alcoholic beverages. Cultivated from at least as early as 200 A.D. by the Zapotecs of the Oaxaca Valley of southern Mexico, the maguey has been essential to life for well over a thousand years. Providing the raw material for building homes and able to be converted into clothing and even rope, the numerous species of maguey (also called agave and the “century plant”) were an invaluable source of fiber for those living in the arid, rocky highlands. Notably, by the time of the Aztecs (14th-16th centuries), it had been discovered that maguey offered an effective cure for both gonorrhea and syphilis, as well as other infections. Since ancient times, the liquid from the maguey’s heart, sometimes called aguamiel (honey water), was traditionally collected from the head and fermented without heating, but simply through the introduction of natural yeasts. This basic process resulted in a drink with an alcohol content of between 4-8%. Still made today, depending on the mixture, it can be sweet and fruity or a bit sour. Many believe it is a rich, and enjoyable, source of niacin, thiamine, riboflavin and pantothenic acid. When the Aztecs were conquered in the 16th century, the Spaniards also brought (and shared) the process of distillation, by which the fermented pulque was heated, and the vapors captured, cooled, reconstituted and collected, resulting in a stronger and purer alcoholic beverage – mezcal. The name is said to derive from a Nahuatl term, metl or mexcametl, and unlike tequila, which can only be made from the blue agave plant, mezcal can use any of 11 types of the different maguey found in Oxaca, including Mexican, blanco, azul, largo, pasmo, tepestate and quishe. At first mezcal was called a variety of names including agave wine and mezcal brandy, before simply mezcal was settled upon. Protected due to Mexico’s participation in the World Trade Organization, the Paris Convention for the Protection of Industrial Properties, the North American Free Trade Agreement and other international treaties, the word “tequila” may only be applied to a particular type of mezcal made in a particular place. The origin of the word is lost in time, but many believe it cam from a Nahuatl term or phrase that alternately meant “the place where they cut,” “the place of work,” “the place of wild herbs,” and “the place of tricks.” Tequila is also the name of a town in the state of Jalisco that was officially established in 1666. Although there is some dispute, most sources point to Don Pedro Sánchez de Tagle, the Marquis of Altamira, as the first person to mass produce tequila, beginning about 1600. However, it was not until 1795 that Don José Maria Guadalupe de Cuervo was the first to receive a license to make it from King Ferdinand IV of Spain. Don Cenobio Sauza was the first to export to tequila to the United States in 1873 when he shipped 3 barrels of it to El Paso, Texas. This was soon followed by a shipment from Don Cuervo, as well. Tequila became much more popular in the US during World War II, when importing whiskey from Europe became very difficult. In fact, the 6,000 gallons of tequila imported in 1940 had grown to 1.2 million gallons by 1945. Today, many credit Jimmy Buffet and his song “Margaritaville” with ensuring tequila’s place in the pantheon of America’s most beloved spirits. Officially, only mezcal is supposed to have the worm, which itself is a caterpillar of the mariposa (butterfly). Known as gusanito and gusano de maguey, it feeds on many varieties of the maguey plant. Its origin in mezcal is not clear and some say that the tradition dates back to Aztec times when the priests would add the worm to batches of pulque. Others believe the practice started later, simply as a means to test the strength of the distilled mezcal. Consumers who prize the worm believe its color to be an indicator of quality. The red worm, which lives in the heart and root of the agave plant, is said to denote a higher quality mezcal when compared with the white or gold worm, who is stuck living out on the maguey’s leaves. 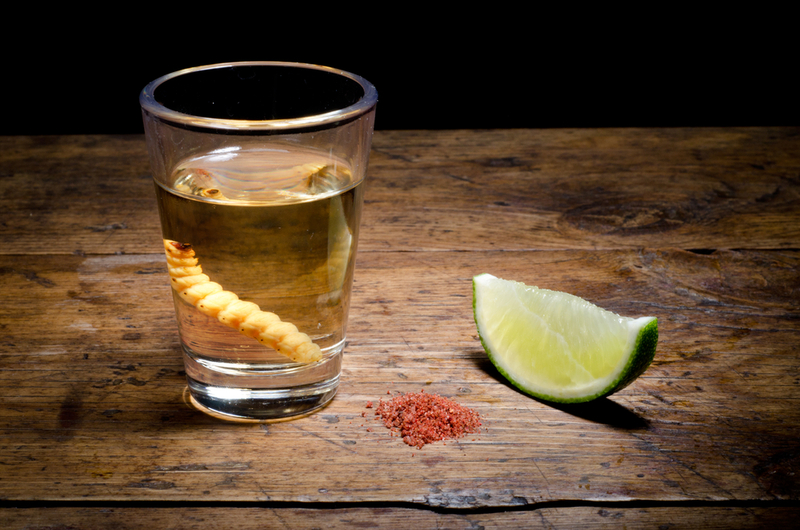 Although Mexicans don’t typically drink mezcal with a worm in it, according to reports, some eat the worms after they have been cured in an alcohol solution. Finally, some aficionados recommend enjoying mezcal with sal de gusano, a mixture of roasted and ground worm, salt and chili pepper. Dias Blue at 111. Dias Blue at 112. Dias Blue at 113-114.